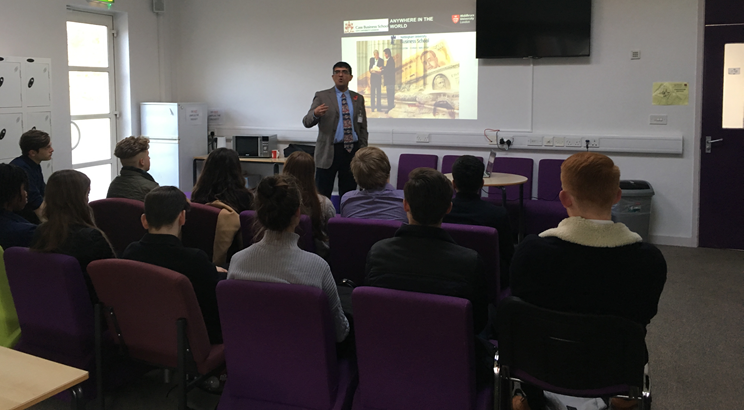 Year 12 and 13 Business and Economic students had the privilege of a special guest speaker on the 23rd June, when Amrit Judge, Associate Professor of Finance in the Business School at Nottingham University, visited the college. Amrit spoke about his experience in the world of Finance so far, touching on the impact of the Brexit vote and how the markets reacted to the shock news. Amrit attended a state school from a relatively modest background, and was keen to get across the message to students that working hard and reading as much as possible about finance and economics is the key to success. He has been a guest speaker at many industry-based conferences around the globe (having just got back from Singapore last week), and has worked for many of the biggest companies in the world of finance and banking. Amrit offered students his personal email address if they had any further questions, and a personal tour of the university if they would like to visit Nottingham at any time. Find out more about Amrit.